As Executive Vice President of Sales and Business Development, Mark is responsible for the Sales and Marketing for the MIS organization. 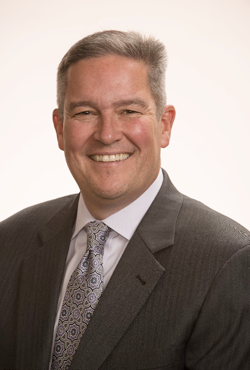 Mark is an innovative entrepreneur with over 25 years of Executive level sales and Sales Management experience in the areas of radiopharmaceuticals, capital equipment, advanced imaging, device, implantables, neuromodulation and consumables. Mark established his career as a start-up and early stage growth implementation veteran and along the way supported several companies with mergers/acquisitions and integration. In 1998 Mark was part of an aggressive entrepreneurial group at Eastern Isotopes, Inc. with the goal of expanding the practice of Nuclear Medicine by focusing on Positron Emission Tomography (PET). Eastern Isotopes was able to establish a national network of manufacturing and distribution facilities to provide reliable, cost effective F-18 FDG to fuel the growth for Oncology PET imaging. As VP of Sales, Mark and his team established themselves as leaders in the industry while also supporting the effort in 2003 to sell and transition Eastern Isotopes, Inc. to IBA, a Belgium based Life Science Company. In today’s ever changing healthcare environment and the day to day operational challenges, practices have had to learn to manage more with fewer resources. Adding a new modality like Cardiac PET can seem like a daunting task but what we have learned from our customers is the importance of offering support at all levels of the practice to effectively and efficiently transition into a successful program. Our ongoing Comprehensive Support approach allows our partners the confidence to utilize our expertise and resources to support the present and future of their practice. Is your practice maximizing cardiac services?